What’s that you say? More peppermint? More chocolate? Powdered sugar that looks like snow? No problem. We got this. 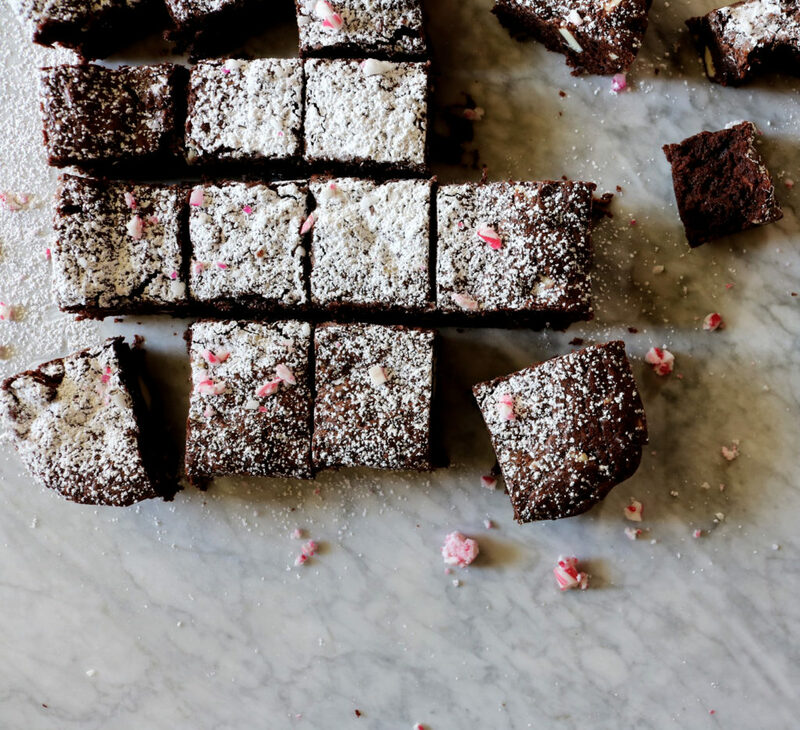 These peppermint brownies are simple, come together fast and are loaded with holiday jazz hands. 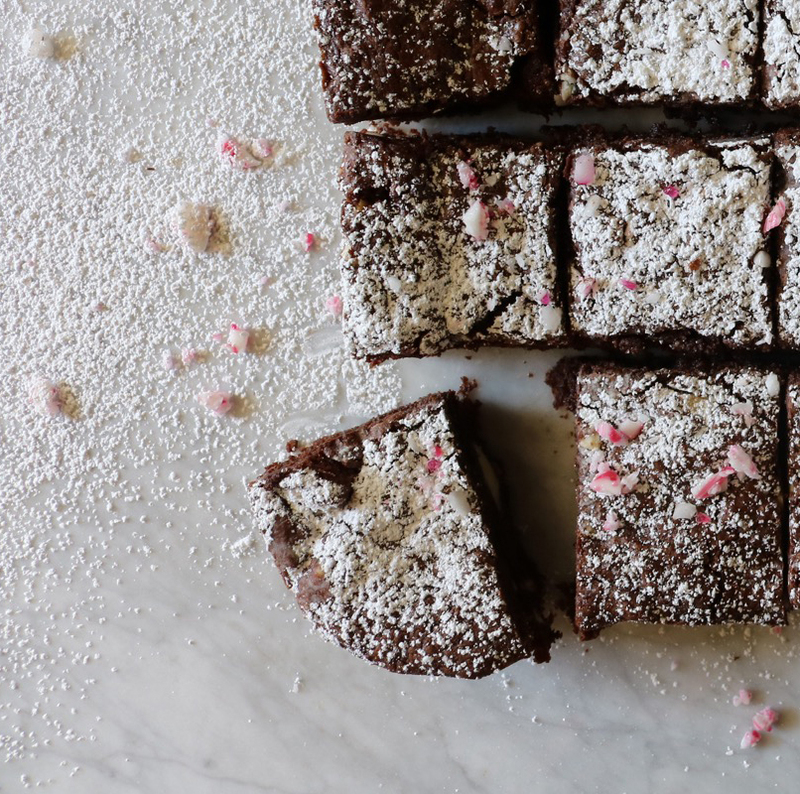 Think hella ooey gooey…my favorite kind of brownie. PS It’s the holidays. Did you get the memo? Suddenly we’re knee-deep in it. And I have a true life confession: I haven’t bought one present. Not one. So in the interest of making people happy on Christmas morning, I’m gonna have to make this post short and sweet. Don’t forget to enter to win that knife — you will die!! In a good way. 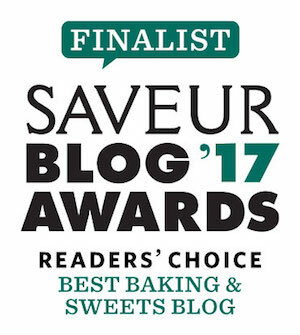 Let’s get our bake on beautiful people! Butter or use nonstick spray on a 8X8 baking dish. If you’re feeling it, put parchment paper in there…you’ll need to cut it so that it fits nicely. Using parchment paper will make it easier to pull the brownies out of the pan when done. In a large, microwave-safe bowl add your chopped semi-sweet chocolate, butter and sunflower seed oil. Microwave on high for 1 minute. Do not overheat your chocolate. Stir the chocolate-butter mixture until smooth and free of lumps. Add the brown sugar, granulated sugar and peppermint extract to the chocolate and stir until completely blended. Then add the three eggs to the chocolate mixture and stir until completely combined. In a small bowl, whisk together your dry ingredients (flour, cocoa powder, salt and baking powder). Add to the chocolate mixture and mix until it is just barely combined. Fold in your chopped peppermint bark. Now here is the most challenging part of brownie making…letting them sit there for 1-2 hours (or more) to cool. It’s brutal. Additionally, if you put your brownies in the fridge to cool they will be extra chewy and fudgy (use caution doing this if your dish is glass). 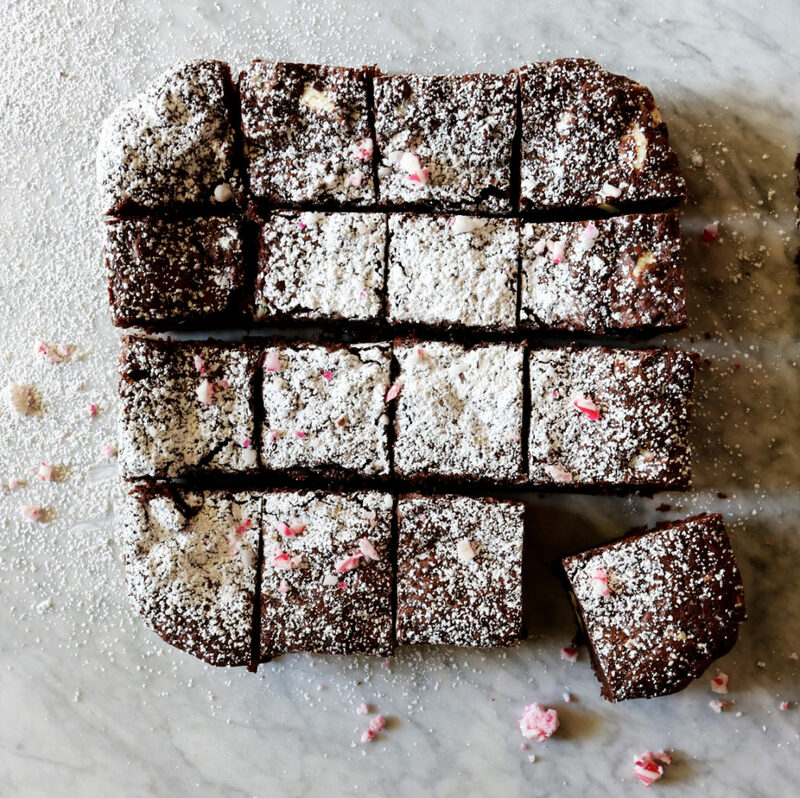 Once cool, dust your brownies with powdered sugar through a fine mesh strainer and sprinkle with crushed peppermint candy. 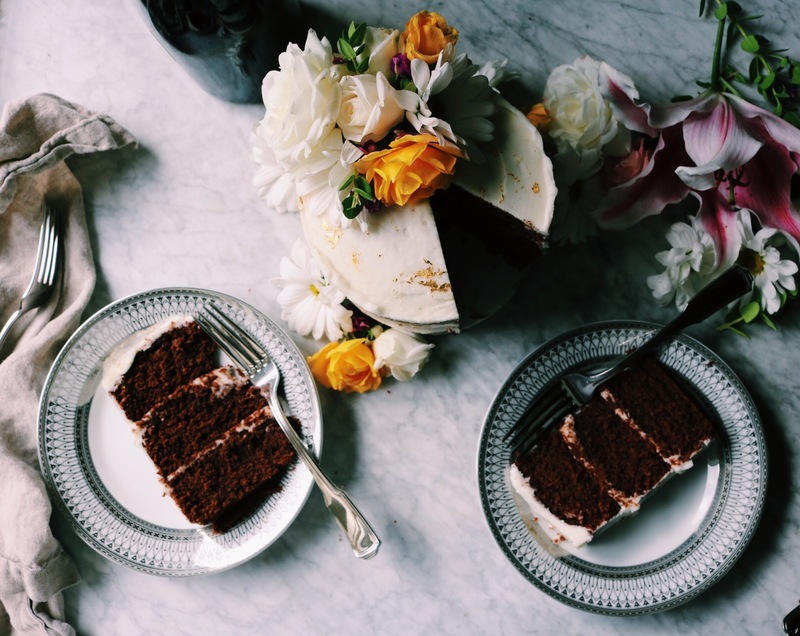 When it’s time to cut the brownies, use a very sharp knife, cut straight up and down and use a wet paper towel to clean off the knife in between cuts. 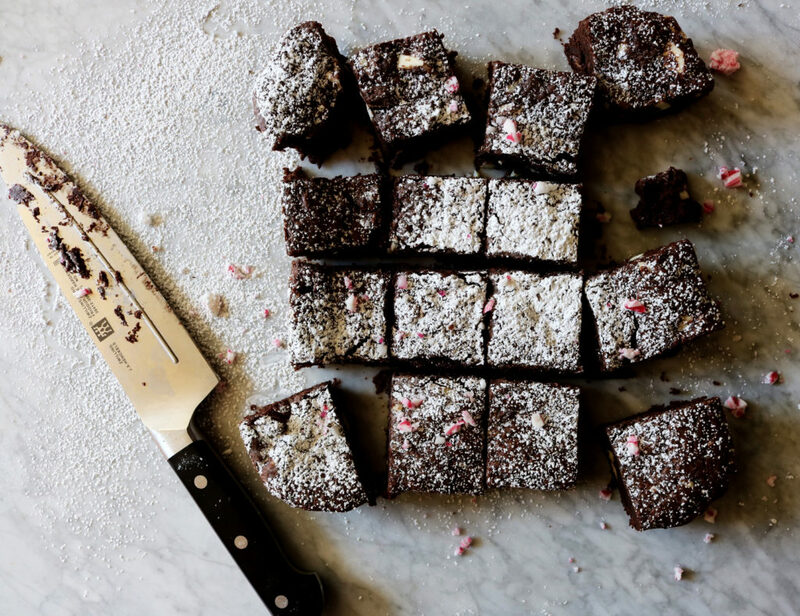 These are UBER fudgy…the longer you wait to cut them, the better they will look. Thanks for making these brownies!! Tag me @displacedhousewife #displacedhousewife so I can see them!! This past week in Napa was mind-blowing. Beautiful wine, gorgeous people, amazing food. I’m putting together a bit of a travel guide and will share soon in an upcoming post!! More Holiday Treats: Buttermilk Gingerbread Cake With Spiced Citrus Buttercream, Chocolate Peppermint Crinkles, Cranberry Bark Peace Cookies, Cranberry Pecan Baked Apples, Candy Cane Ice Cream With Chocolate Pudding Cakes, Double Chocolate Peppermint Bark Cookies, Chocolate Peppermint Bark Crinkles, Cranberry Spice Breakfast Buns, Cranberry Scones, Salted Caramel Pumpkin Cheesecake, Five Spice Cranberries (three ways), Apple Spice Cake, Boozy Sugared Cranberry Cheesecake, Pomegranate Rosemary Cocktail, Easy Labneh Appetizer, Persimmon Salsa, Port Cranberry + Apple Petite Rosette Tarts, Pomegranate Burrata Salad, Fresh Fig + Toasted Pecan Salad, Bacon Brussels Sprout Slaw, Baked Cranberry Apples and Five Spice Cherry Pie. 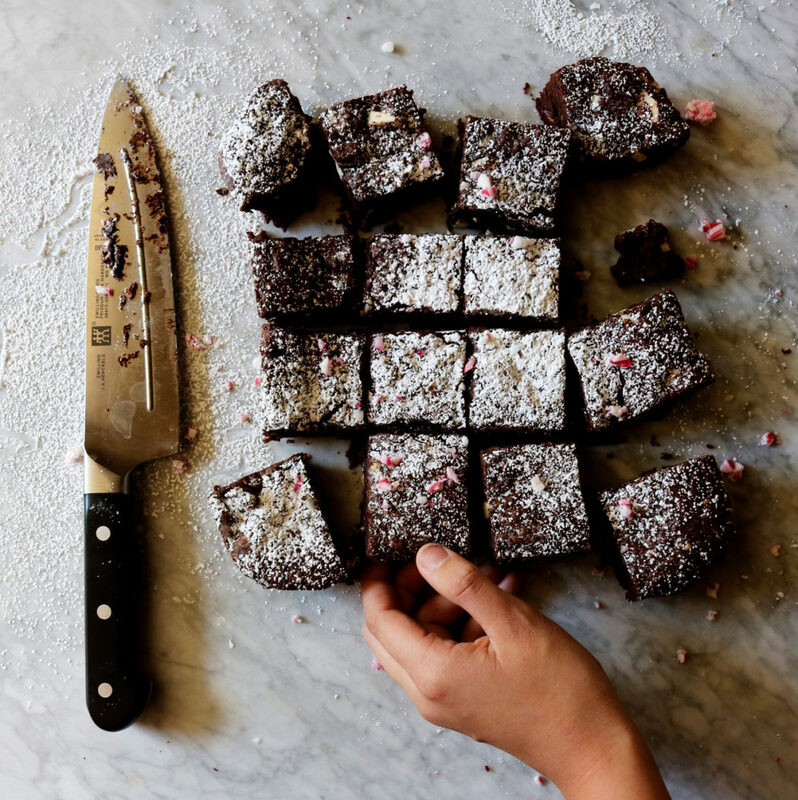 Those brownies are simply amazing and YAYYYY for the holidays. My boys would love to be your neighbor. I JUST baked brownies last night. They’re awesome, but wish I’d seen your peppermint recipe before that for a festive treat! Yummmmm!!! Gonna make this for baking day!! Those brownies sound amazing! So festive for the holidays. You are speaking my language with these brownies! Seriously love! i always have such struggles cutting brownies into nice pieces. probably because i’m lazy and just go at it with a knife when the brownies are hot and i don’t wipe off the knife in between cuts. will have to do both because your cuts are so clean! i never tire of the chocolate/peppermint combo so keep em coming! and i literally spent the past 4 hours shopping online for presents…it was my first stab at holiday shopping. argh! can’t wait to read about the napa trip…sounds amazing! 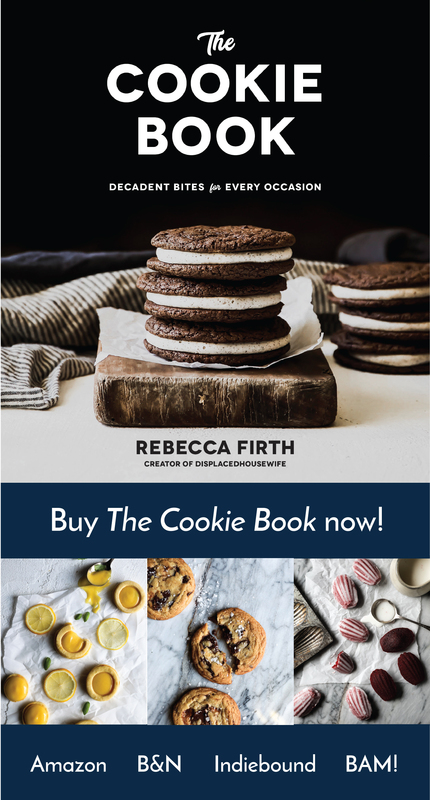 It’s too bad I didn’t make these in time for a Christmas party I just went to…now I can’t share () but actually, you kill it Rebecca this recipe is to die for. These look so utterly delectable! Omg, I haven’t bought one present yet either! These look way too good, I literally would eat them all!! I am in need of a real knife like this one as mine are cheap and dull. Mint & chocolate are already a match made in heaven… triple mint?!?! OMG I need this in my life NOW! These brownies sound delicious! And that beautiful Henckles knife!! Who can resist wanting either one!! Lol I’ve heard many great things about Henckles knives! Happy Holidays to all!!! This suits my current pregnancy palette to a T! Looks beautiful too! Triple peppermint? Is that because double isn’t good enough for you? Ha, love it. These look like the perfect little holiday bites. I’d love to get my hand on that awesome knife! Gorgeous brownies, and gorgeous knife!! I love everything peppermint this time of year – and the peppermint-chocolate combo package? dreamy :) Best of luck with the shopping… We’ve actually ditched present-giving this year in favor of travel and it’s hugely freeing. MB — I love that you ditched gift-giving!! I’m trying to do a majorly pared down gift thing…because, frankly, we’re so lucky and I feel like we already have so much. It feels like excess sometimes. But, we’ll see how that goes… Yes to peppermint and chocolate!!! I think it’s all I could do until the end of the year!! Sending lots of love! I’m hoping since these are petite brownies that I get to eat way more than one right?! The chocolate peppermint combo never gets old during the holidays Rebecca! Adding these to my must try holiday baking list! Good luck with the shopping!